Skittish Great Blue Heron as seen from the reservoir wall. During my visit to the places of my childhood earlier this month, I stopped by Delta (Ohio) Reservoir. Well, actually, now there are a couple of them… maybe even three but I don’t know the full history. There was a small pond that had pretty much gone back to nature when I was a kid; a great place for spotting turtles and trying to catch frogs. That pond may have been the village’s first reservoir. Then there was the big, deep-water reservoir where the town’s water came from. Today there is a third, much larger, reservoir immediately adjacent to the “middle” one and that middle one now is looking a bit more like a wildlife refuge than water storage area. 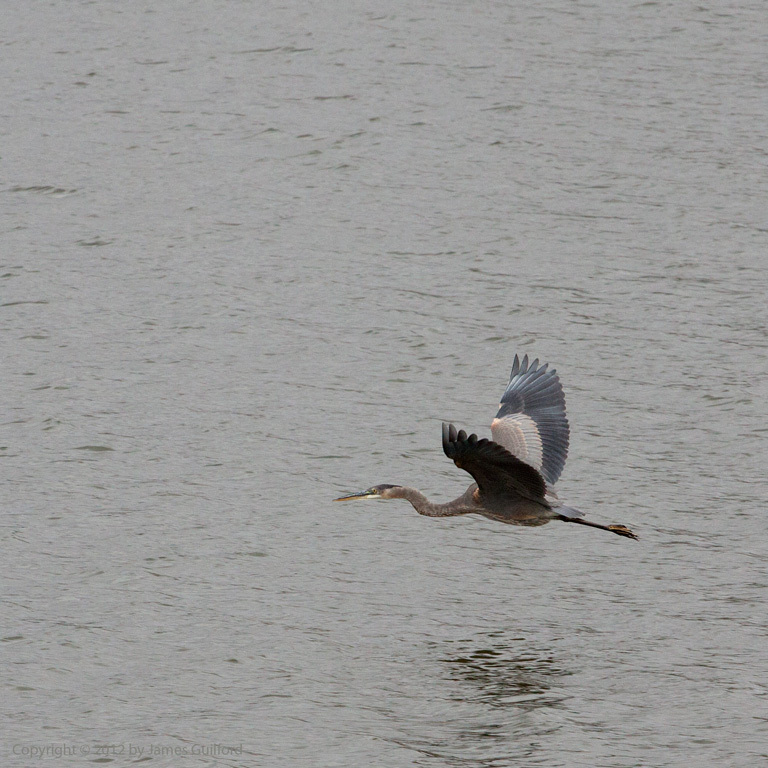 During my visit I was pleased to see a couple of Great Blue Herons fishing the edges of the reservoir. Maybe because the surroundings were more open or perhaps these birds just aren’t used to people, whatever the reason they were skittish. I could not get nearly so close to these herons as I often could back home. Still, I caught one stalking the reeds along the eastern rim and got a few shots of a couple flights — all at a distance. 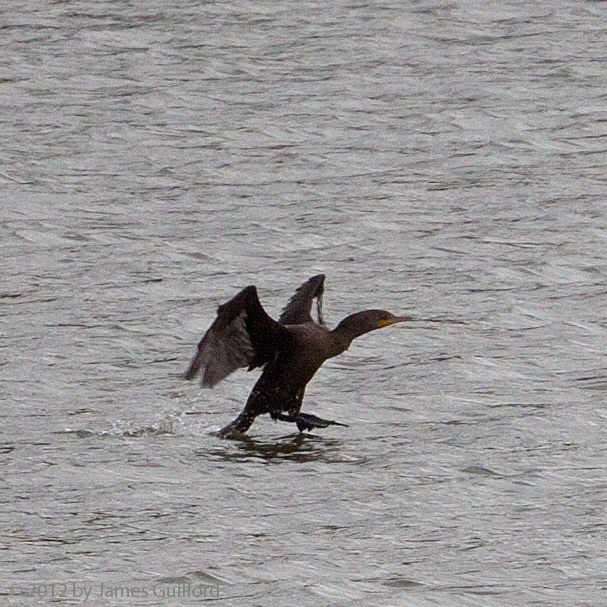 Double-Crested Cormorant landing on Delta Reservoir. It was grey, windy, and chilly so I was getting ready to continue my car trip when I saw a jet-black silhouette — a pretty good-sized bird was swooping in. What the…. ? As it landed in the cold waters and its body sank mostly beneath the surface I realized it was a cormorant! Now I enjoy watching birds but I don’t call myself a birdwatcher. I thought the sight was pretty rare and for me, it is, though not in the greater scheme of things. Some time ago, water pollution and loss of habitat brought the skilled underwater fisher-birds dangerously low in population. Reportedly in the ’60s, the cormorants had nearly disappeared from Lake Erie (both Lake Erie and Lake Michigan are not distant from my Northwestern Ohio origins). With environmental improvements and protection, however, the cormorants succeeded in their recovery so well they are apparently now something of a nuisance! The black bird’s great numbers are blamed by some for depleted fisheries and damage to forests. 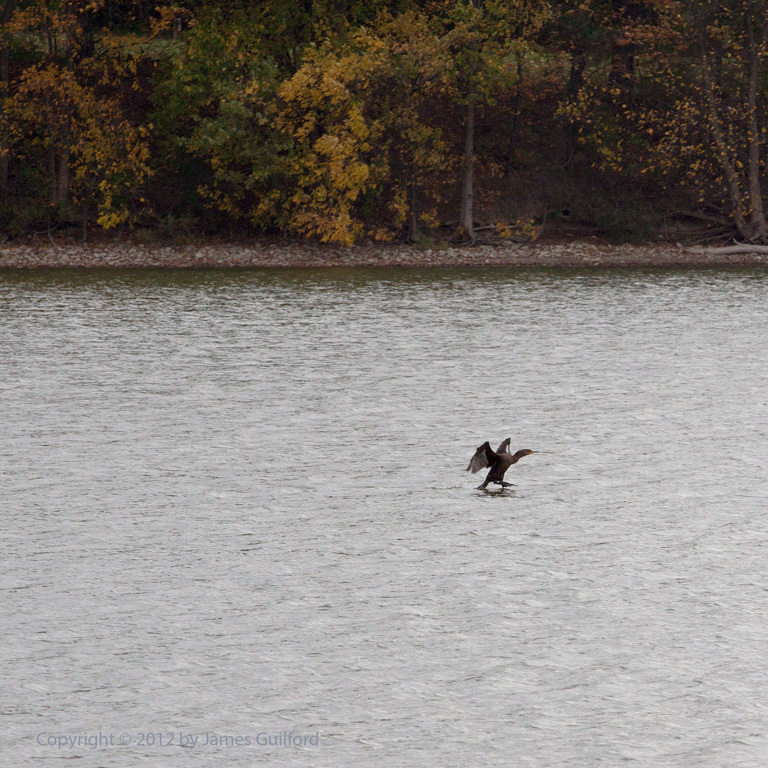 Tight crop of the already-cropped photo seen above showing a Double-Crested Cormorant landing. That day, however, there were only two on the small lake from which Delta draws its water. Though I was ill-prepared to photograph yet another shy bird keeping its distance so well, I gave it a try. These are my first shots of a Double-Crested Cormorant, heavily-cropped to make up for the measly 200mm telephoto lens I’d packed. I like ’em anyway.